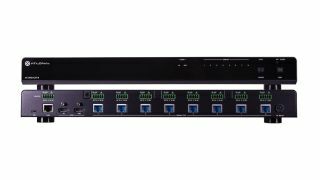 4K/UHD distribution amplifier from Atlona The What: Atlona is now shipping its eight-output 4K/UHD distribution amplifier that features HDMI-to-HDBaseT distribution of 4K/UHD@60fps Hz/4:2:0 video, HDBaseT transmission up to 70 meters, HDCP 2.2 support, and Power over Ethernet (PoE). The AT-UHD-CAT-8 also provides EDID management and advanced display control functions through Consumer Electronics Control (CEC) for use with home TVs. In addition to HDBaseT outputs, the new DA provides an HDMI output for signal pass-through and daisy-chaining, and it is equipped with one IR and RS-232 connection for the amp as well as one for each output channel. With today¹s announcement, Atlona is now shipping the complete line of 4K/UHD distribution amplifiers introduced earlier this year. The Bottom Line: The AT-UHD-CAT-8, which is rack-mountable and fits in one full-width single RU space, has a suggested retail price of $2299.99.